We’re going to be making a comic strip out of this. 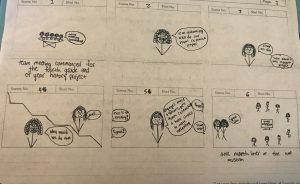 The comic strip shows that rather than completing a research paper, the students are going to conduct a wax museum to display what they have learned. The wax museum will be more memorable and allow the students to grasp a better understanding of the material that they are learning about.